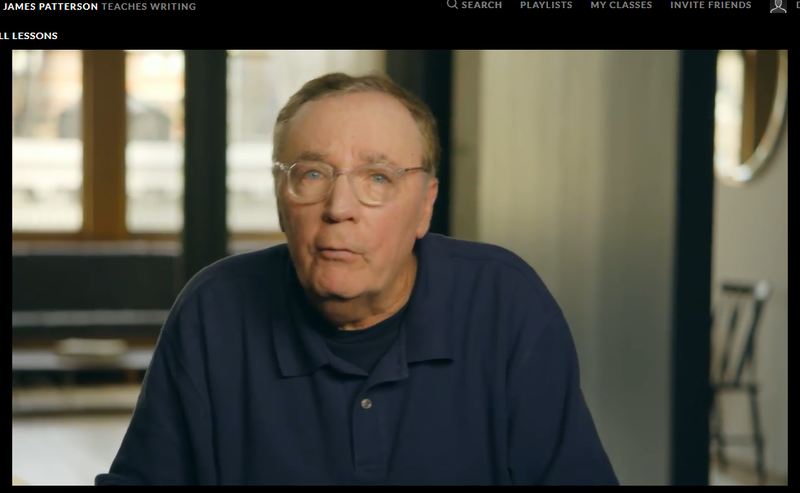 If you want to learn how to write a best-selling thriller, like James Patterson, all you need to do is to take his masterclass.com writing course. Surprisingly, he really does show you exactly how to write like he does. I love the way James Patterson starts his course. He sets the scene and lets you know that you are in for a little fun as well as a few hours of learning. This is not a dry as a bone writing course. Far from it, James’ teaching style is every bit as interesting as his writing style is. It is part of the reason, I enjoyed this course enough to take the time to sit down here and tell you about it. James has put together a course that will appeal to readers as well as writers. I genuinely think anyone will enjoy taking this masterclass.com course. Below, I explain why that is and provide you with information that will enable you to understand just how good it is. James starts out by explaining that if you are passionate about writing – you will get your book written regardless of how hard it may seem to do so. You will be compelled to write. At this stage, James explains how he ended up becoming a writer – where he got his passion. His is a slightly odd journey. Not one that everyone can follow exactly. But, the principle is the same. You need to ignite that passion to write in you. To know that you really really want to do it. Becoming a writer takes dedication, so you need to be well motivated. James Patterson spent a week with Trappist monks thinking things through deciding if he really wanted to be a writer. In this silent monastery, he had the time and space he needed to work out what he really wanted. Time to set himself up mentally to follow his dream. You are lucky if you find something in life that you love and then it is a miracle if someone will pay you to do it. One of the things I really enjoyed about this course was the fact that James was so frank and honest. He shares tales of the rough times as well as the good times with his students. A way of teaching that makes you sit up pay attention and realize that, with the right approach and guidance, you can definitely become an author too. It was surprising to learn that even James Patterson has written books that have not been published. He shares this fact in a frank way, but quickly follows up by explaining how to prepare for and handle rejection. Like most people, James had to work a day job to pay the bills, when he first got started. But, he did not let that stop him from writing every day. He got up at 5 am to make sure that he did not break the writing habit. Even when he did not feel like it, he still did it. In his course, he explains how you can do the same without exhausting yourself. To become a writer, you need good plot ideas. So, it was great to learn how James comes up with his book ideas. You will be stunned by just how many different ways he does this. To start with, James is a voracious reader. At times, he reads about 10 books a week and his reading list covers all kinds of subjects. I can vouch for the fact that what you read has a huge impact on your ability to write. It certainly does in my case. If I read too many coffee time magazines my ability to research and write factual pieces goes right out of the window. This section of the course also taught me the importance of being more observant as I go about my daily life. I have also started to read more about all kinds of things. Stuff that I have never bothered with before. A habit that is really opening up my mind. In just one week, I came up with several pretty good ideas. As James suggests, I have written them down and drawn up a brief outline for each of them. Whether I take the next step and turn them into something more substantial remains to be seen. But, it is great to know that I have the ability to come up with interesting ideas, and do so fairly easily. This was the most interesting section of the course. Laying the plot out in advance makes sense, but James goes much further than just telling you how to do this. He makes you appreciate the need to cut the fluff, at this stage in the creative process. James also explains how to weave emotion into the story, to draw the reader in. Apparently, women read far more than men. Around 70% of all books, including the ones Patterson writes, are sold to women. So, getting this aspect of the plot right is important. I loved the free outline he provided. It helped me to make sense of a lot of what he taught me. In some ways, I found reading the outline to be more enjoyable than reading a full-length book. It was especially interesting to see how the twists and turns of the plot were incorporated into the outline, plus, at points, James explains how the reader should feel after reading a certain section. I recommend that before taking the course, you download the outline and read through it. If you do that, what James is telling you will make a lot more sense. Getting the details right is essential. You need to get things right to convince the reader you know what you are talking about and keep them with you. In addition, the research process stimulates your writing. I also liked his explanation of how to interview people, when carrying out research. In this section of the course, James reminds you that readers can develop an attachment to charachters. They become real to them, which is why he regularly gets letters from people asking him not to let any harm come to a certain character. So, it is important to create them well. Fortunately, he explains exactly how to do that. Before buying a book, I usually open it up and read the first paragraph. If it does not grab my attention I close it up and continue my search. This is the case whether I am buying online or in a bookstore. From the sounds of things, I am not alone in doing this. In fact, according to James, the first four words you use are critical to the success of any book. You need to grab the attention of potential readers with your first line, or you can forget about becoming a successful author. Fortunately, doing this is far easier than you may think. James shows you exactly how to do it. These tips are invaluable. For example, deciding which ‘person’ you are going to write in does not sound that important. However, when you listen to James you soon realize it is actually one of the most important decision you are going to make during the creative process. James gently goes through why you have to do things in a certain way. His aim is to save you a lot of pain and heartache. Rather than just lay down the law, James explains why, for example, you have to take the time to sit down and write an outline. This is part of the reason, he covers that subject in such detail. There are two videos that walk you through the process of writing an outline. As someone who writes a lot already, I can tell you writer’s block is a real thing and it is a right bugger. Usually, it strikes when you’re up against a deadline. You’ve got 20 pages to write for someone’s website by the end of the week and your mind is going around in circles. I’ve been there, many times, and I hate it. 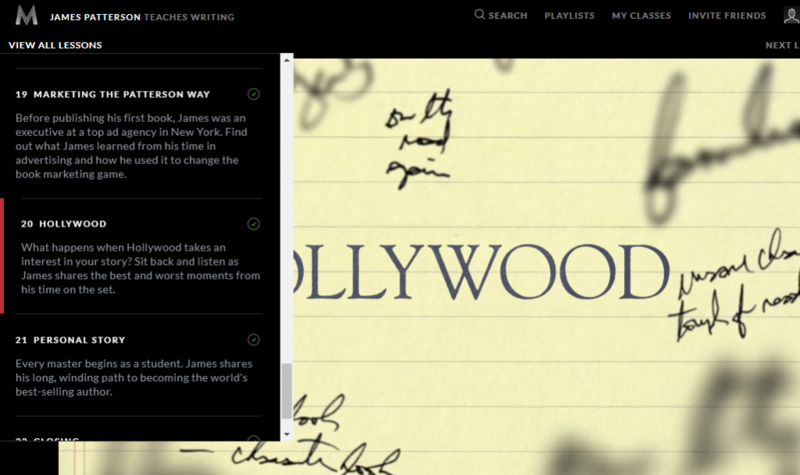 So I was very relieved to see James cover the subject of writer’s block and do so in such a comprehensive way. His methods flat out work. For me, this was the most useful and important part of the course. No more torturing myself. If James Patterson allows himself to write a few bad pages as a way to push himself through writer’s block, I should definitely be doing the same. Taking this approach keeps the momentum going and gives you something to work with once things start to flow more easily again. The way he drafts and rewrites his books is fasinating. It is a writing process I am definitely going to try. I was also intrigued to learn that he writes his initial draft long-hand. 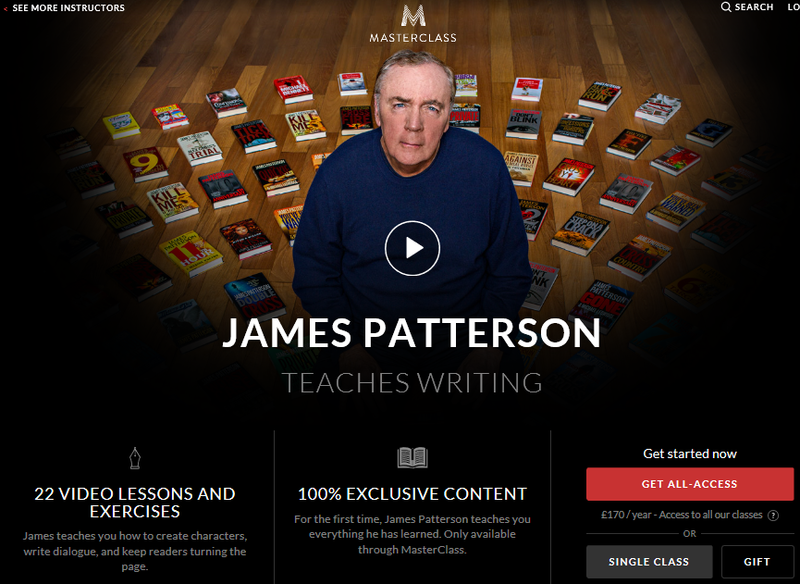 The layout of James Patterson’s Masterclass.com workbook is fantastic. It covers everything that is in the course and much more besides. 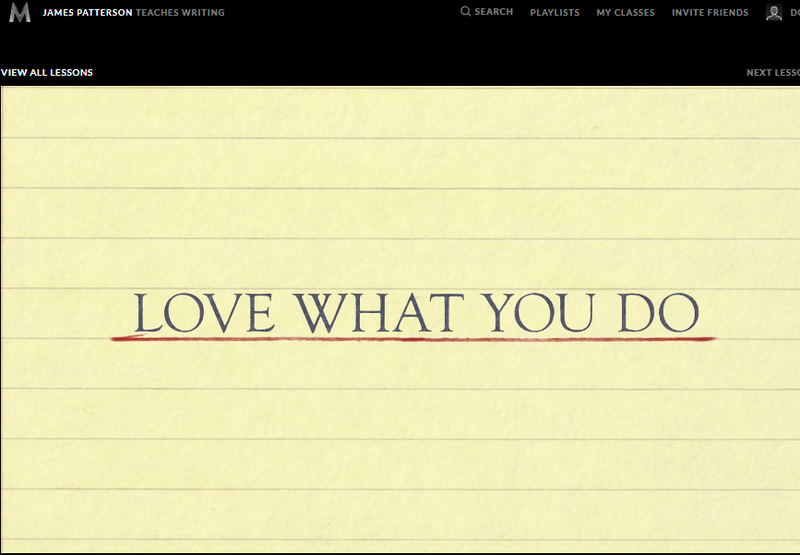 This is also where you can find links to some fantastic writing tools. For example, the inspiration finder and the What-if-inator. Surprisingly, a lot of them are free to use. Also contained in the workbooks are assignments. These are interesting to complete. They cement what you just learned and will motivate you to get going. Included in the workbook are samples to help you to see what you are aiming for, which is helpful. There is also space left to enable you to note down your observations about each section of the course. Writing your book is only half of the story. Getting it published is the next challenge. If you are not familiar with the world of publishing, finding your way through this part of the process is tricky, to say the least. 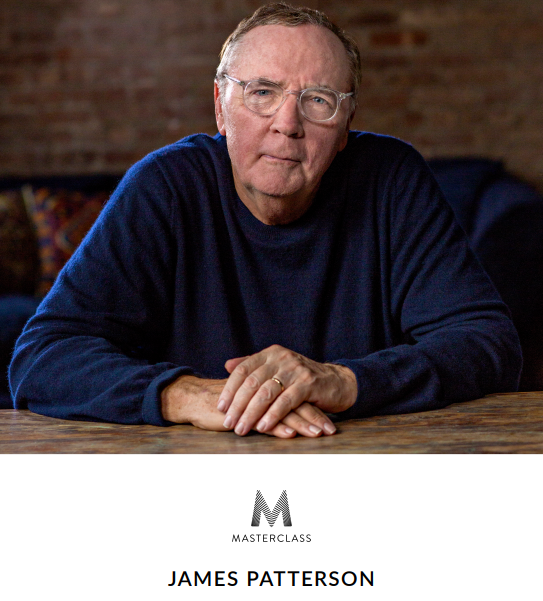 So, I was pleased to see James Patterson covering getting your book published and marketing it, in-depth. Masterclass.com has a very interesting feature called Office Hours. This great resource enables students of the various courses to get their questions answered directly by the instructors. Almost unbelievably, you can get famous writers, actors, chefs. music stars and sports personalities to answer your actual questions. This is priceless, as well as thrilling. 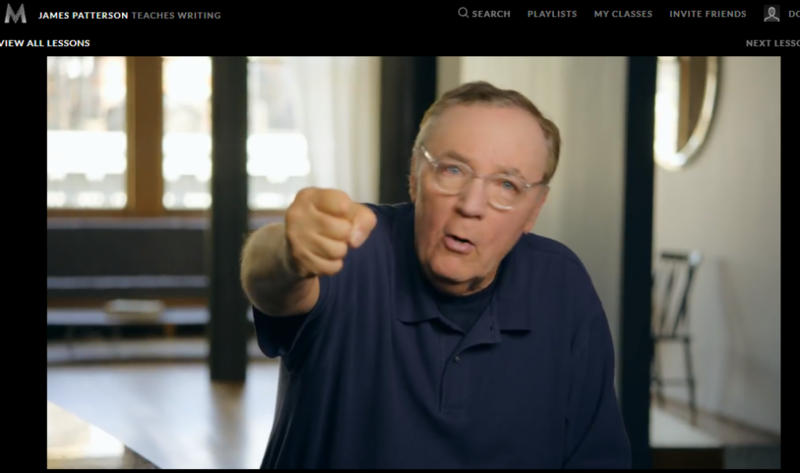 When taking James Patterson’s writing classes, I strongly urge you to tap into this resource. You will pick up lots of interesting extra tips when you do that. If you want to learn more about the special features that masterclass.com offers to all of its students, you can do so by reading my full masterclass review. As you can see, I really enjoyed this course. It has not motivated me enough to sit down and start writing a fiction book. But, it has still had an impact. A positive impact at that. I am reading much more than I did, which I am really enjoying. Taking the course has made me look at and appreciate books in a whole new way. Plus, this course has made me open my eyes and my mind to take notice of and be curious about what is going on around me. Most importantly of all, I now have several, new, and effective ways to deal with my writer’s block. Tips I know that any student, website owner or course provider would also benefit from knowing about. Right, that’s me done. I am off to treat myself to some of James’ great books and try out another writer’s masterclass. There are 8 in total, taught by great authors and writers like Margaret Atwood and Neil Gaiman. So, I am curious to see what they have to say on the subject. In all likelihood, I will also take a look at the tv show and screenwriting courses. I’ve bought the masterclass all-access pass, which means, if I want to, I can take any of their 50+ courses without having to pay a dime more.